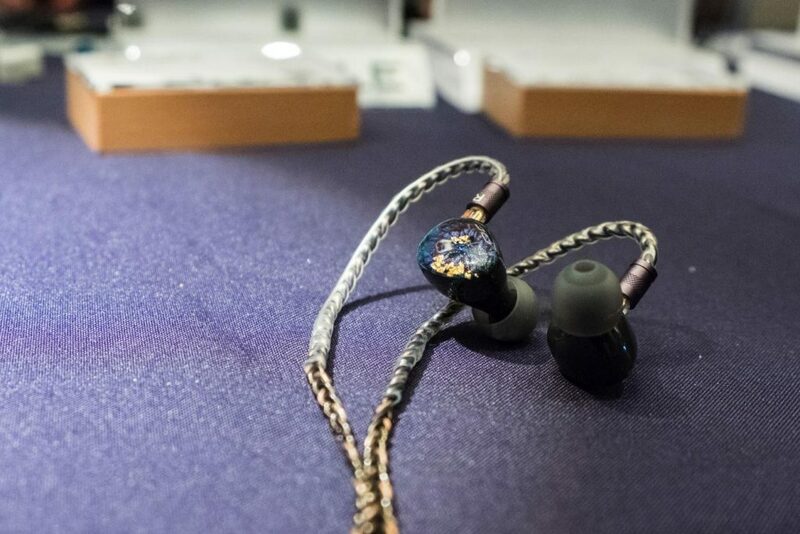 Custom Art have made their way to Singapore with two buzz-worthy in-ear monitors: The ultra-innovative FIBAE Black and the brand-new FIBAE 4. Also present was Custom Art’s CEO, Piotr Granicki, who you can never fault for his passion or enthusiasm. As always, it was a pleasure catching up with the man, and here’s what I thought of his latest release. Custom Art FIBAE 4: Custom Art’s FIBAE 4 is driven by low-end weight, not dissimilar from the FIBAE ME I auditioned last year. The bass has a thump-y quality that comes across pleasing and exciting; especially with synthetic kick drums. It doesn’t have quite the depth of a dynamic driver, but this is impressive impact nonetheless. The upper regions have been brought up to match as well, especially the upper-midrange. The FIBAE 4 possesses vibrant vocal projection. Vocalists carry body and weight, but those gritty notes in the throat are emphasised. Singers like Brian McFadden or Rod Stewart sound a hair drier than they normally would. But, there is an effortful-ness to their performance that gets the emotion of the track across, which is the more important quality to me. Female vocalists tend to fare better because of the projection and the top-end’s smoothness. This comes from a mid-treble dip, which softens articulation and results in an energetic signature without fatigue. However, the trade-off in clarity and definition may take a bit of getting used to. In terms of image separation, the bigness of the instruments inhibit that a bit. I hear a freer, less crowded stage with the FIBAE Black, for example. But, that’s more so because of the Black’s laid-backed-ness above anything else. Overall, I think the FIBAE 4 is a great entry in Custom Art’s line-up. It is entering a saturated market with its more mainstream signature, so the verdict is still out as to how it’ll rank among its peers. But that aside, it’s a potent release from Piotr nonetheless. Accompanying Custom Art on their flight were compatriots: Lime Ears. Lime Ears have always held a special place in my heart for popping my flagship cherry, so to speak. So, seeing them year after year and goofing around with their head honcho, Emil Stolecki, always makes for a wonderful time. This year, they brought a refresh of their flagship Aether called the Aether R. Featuring an additional driver for headroom and a slight tuning tweak, here are my thoughts. Lime Ears Aether R: The Aether R thankfully maintains the Lime Ears house sound through and through. Heaps of clarity and air resonate within its soundscape, paired with a natural, well-balanced and sufficiently-bodied timbre. 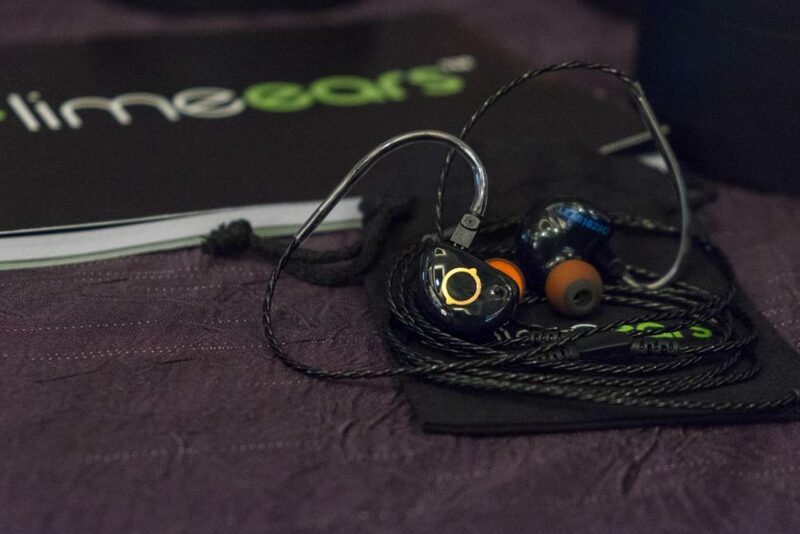 Among all of Lime Ears’ previous models, I feel they’ve made major strides in spatial performance. The depth that the original Aether had is now paired with stronger resolution, so that distance does not translate to detachment. And, image stability, left-right separation and background blackness all mark career-highs for Lime Ears, due to high extension and coherency. The balance between the upper-mids and treble is excellent. Vocals sound like they flow from the chest to the mouth in an even-handed, smooth and linear manner. There is more energy towards the upper-registers, so the fuller harmonics sound more laid-back. Hi-hats, cymbals and snare drums continue to be highlight instruments, as they crackle and pop with immense clarity, and zero fatigue. The extra low-end driver intended to add headroom has delivered too. The bass comes across more nimble. Personally, I would’ve loved more warmth to bind the image a hair. Adding a couple dB’s to both the switch down and switch up modes wouldn’t have hurt, especially considering how flat switch down is down low. All in all, the Aether R succeeds in what it ultimately set out to do: Maintain that gorgeous Lime Ears house sound and package it in a technically-capable, well-defined and transparent soundscape. Being frank, I do have a bias towards their signature tone, so take it with a grain of salt when I say the Aether R is perhaps my favourite all-rounder among the many I’ve heard recently. And without a shadow of a doubt, I absolutely can’t wait to hear the Aether R in custom form. 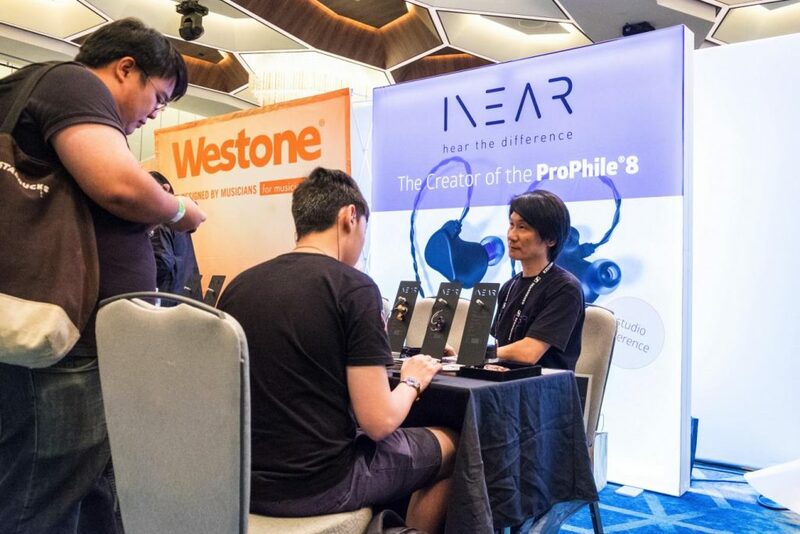 InEar is a German monitor manufacturer responsible for the critically-acclaimed ProPhile 8. At the show, they showed off their flagshp in a plethora artisan shells. This included wood and wood-resin hybrids. Unfortunately, their booth was so busy that I did not manage to snap a pic. Though, there are images of them on InEar’s social media. Nevertheless, I did manage to hear an acrylic InEar SD5 (which, I’m told, sounds a bit different from the more popular wood variant). 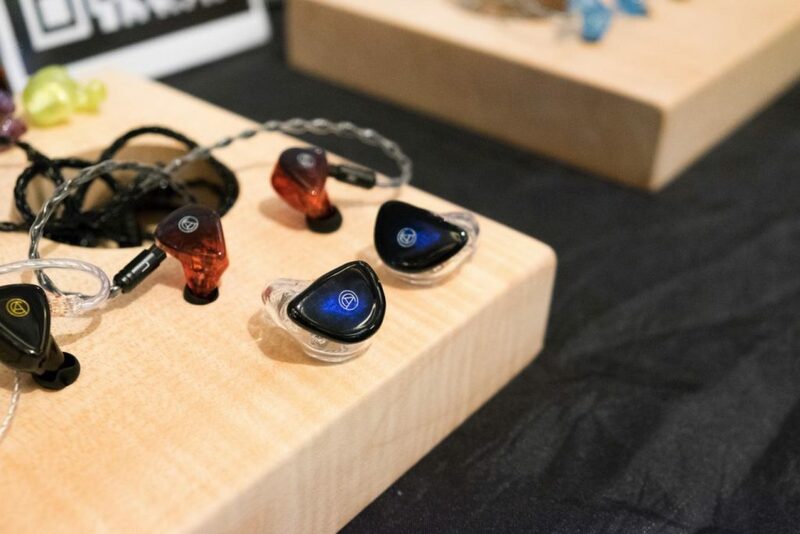 InEar SD5: Interestingly, InEar’s acrylic SD5 is an intimate-yet-open-sounding IEM. The stage it exhibits is large and airy, especially along the x- and y-axes. But oddly, the SD5 lacks any sense of depth; almost as if the audio was coming from inside the head. Now, there are several advantages to its presentation. Along with the SD5’s clarity, this intimacy allows for an engaging, involving vocal presentation. Its forwardly-positioned upper-mids and treble contribute to this too. The low-end provides sufficient rhythmic drive, but definitely comes last on the frequency response totem pole. There’s an emphasis on low-end melody, along with physicality provided by extension. Mid-bass warmth has been kept subdued to prioritise the upper regions. Female vocals particularly shine here. Singers sound up close, articulate and clean. But, there is a neutrality to its tone that some may not prefer; a lack of emotional warmth, perhaps. The SD5 is for the vocal lover who prefers a higher-pitch, who don’t mind an inside-the-head soundstage, as well as a clinical-ness in delivery. 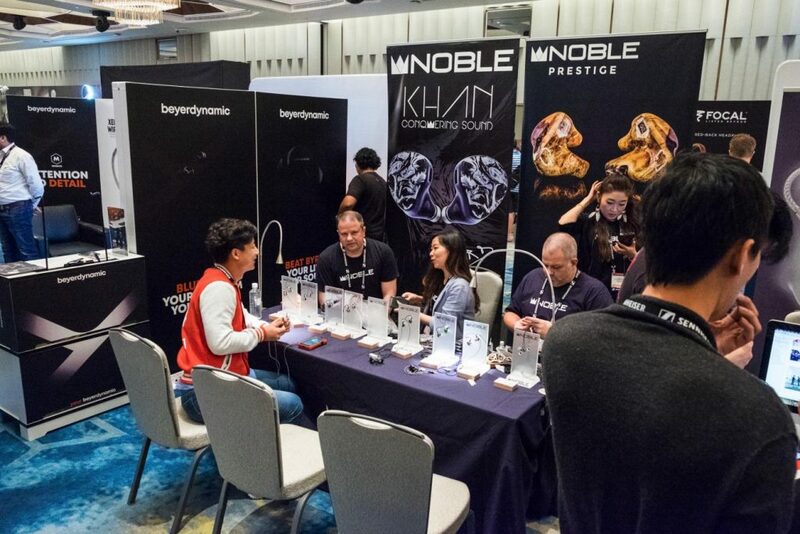 Noble Audio were present at the event, showcasing their flagship Khan and the all-new Savant II. 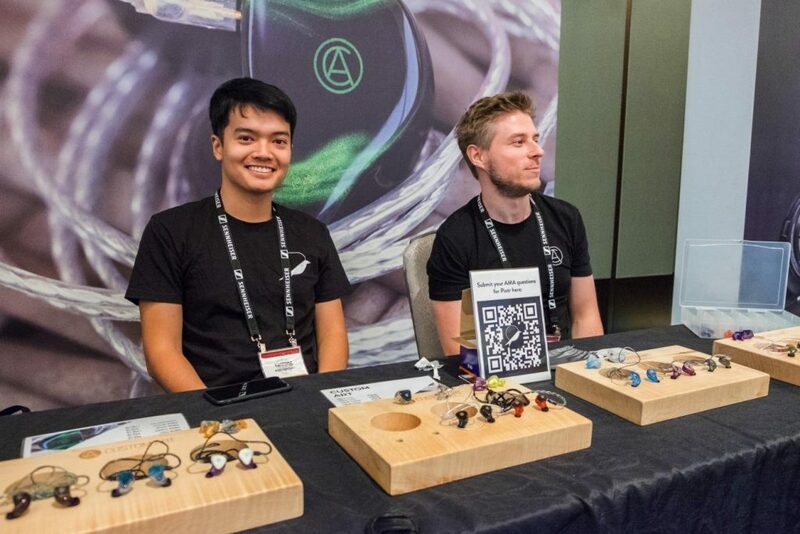 It was a pleasure to meet the Moulton brothers, along with the Wizard’s partner Joy, whose artisan faceplates have been making the rounds online. I did not listen to the Khan at the event, as I’ve covered them previously here. 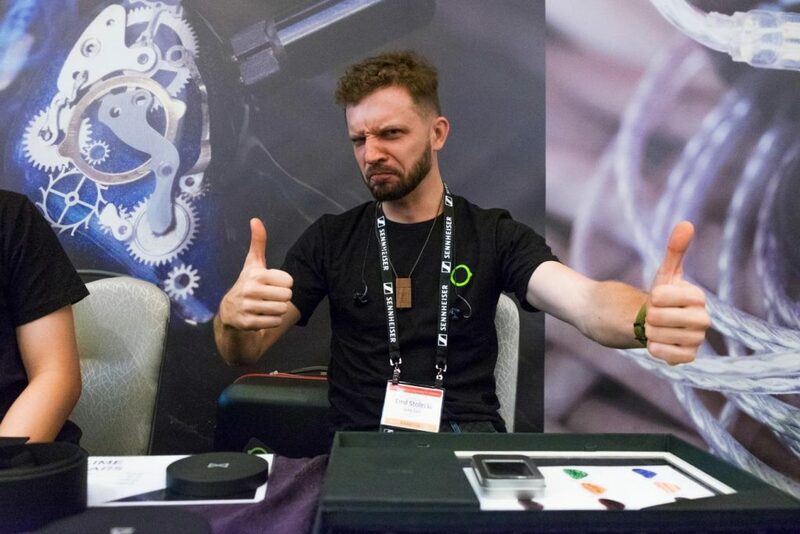 But, I did hear the Savant II – the successor to Savant and (I assume) Sage – which ended up becoming one of my clear favourites at CanJam SG 2019. Noble Audio Savant II: Having heard both the original Savant and the Sage, I was very, very impressed with what the Savant II brought to the table. Most notably, it succeeds where I felt the other two tended to falter: Bass extension and physicality. The Savant II offers a dense, meaty and impactful low-end with excellent body, presence and physicality. It’s not a basshead IEM by any means, but it can deliver in spades if the track calls for it. This transitions to the midrange; emotive, nuanced and natural in tone. Instruments possess a genuine sense of depth that effectively conveys dynamics and drama when listening to powerful balladeers. But, also in the Savant II’s arsenal are clarity and air, which emphasise the tiny nuances in simpler arrangements. It’s truly a vibrant, organic and technically-refined response for all genres. The treble possesses a wonderful balance between body and cut. Clarity and articulation are strong, but the timbre of the top-end comes through as well. When listening to drummers strike ride cymbals and hi-hats, those hits carry weight, and the tone of those instruments come through as well – rather than coming across as crisp, one-dimensional wraiths. The transition between the midrange and treble is superbly done as well, so instruments with a higher range of pitch maintain coherence as they move up the scale. The low-treble may barely inch towards glare with certain recordings, but it consistently stops before ever becoming brittle, honky or harsh. As a result of top-end extension, definition across the board is impressive too. Stage size may not be spectacular, but the stability and nuance it sports is. Graceful balance and refined skill have made the Savant II a natural-sounding, versatile performer – ideal for all genres and listeners too.